Our secluded, luxurious and private property provides a quiet environment for complete body & mind renewal supported by the practices of yoga, an organic nutritionally balanced diet and the undisturbed beauty of the natural surroundings. With beautiful gathering spaces, gorgeous provencial rooms, and plenty of fresh air and space, your group will quickly appreciate the power and wonder of their time here. Whether you need to host an executive retreat, a corporate think-tank getaway, or a reunion with good friends, Bastide Avellanne is an inspirational location for small gatherings. We have indoor meeting/yoga space for up to 30 people, in addition an outdoor yoga shala in bamboo overlooking the vineyard (100sqm). A transformational week of NEUROSCIENCE, MINDFULNESS an YOGA to nourish your body, mind and spirit. Our mission is simple! We want to inspire people to raise their level of consciousness and make a difference in the world. This Transformational Retreat is for us a way to live this mission by supporting people who join us to live a mindful life. Once they make their inner shift, everything around them positively changes. Our commitment: everything we share is supported by Western science and by 5000+ years Eastern traditions. We do not share anything that we haven’t practiced for years! This retreat will be a detox for the mind, body and soul. We will serve a vegetarian diet, encourage abstaining from alcohol (apart from a few welcome drinks and wine tasting) and also from technology. We have 18 places based on people sharing, we will be very thoughtful when allocating rooms but if you are travelling with somebody else and would like to share with them please let us know. Likewise if you have any particular requirements which mean that you need a private room please let us know and we will do our best to accommodate. A perfect retreat for those looking for a peaceful getaway. The stylish and elegant Bastide Avellanne is your home for the week that overlooks the majestic Provençal landscape. Yoga, art, day trips, markets, visit to the sea and perfume making are only some of the splendors to look forward to! This retreat with be open for all levels of artist. Marianne Chayet is a fantastic teacher with tremendous charisma and postitive attitude to her work. She gives attention to each student by highlighting their strengths, encouraging to work on their weaknesses and praises them for their work. Join Brent next June for a week of yoga and travel-adventuring around this southern French wonderland! In addition to morning and afternoon yoga and mediation practices, as well as twice-daily gourmet, chef-prepared meals, we’ll also enjoy excursions to the breathtaking Gorges du Verdon, the white-sand beaches of Porqurolles Island, the charming markets in the town of Cotinac, as well as a special wine tasting tour at a local vineyard. Of course, there will also be ample opportunity to relax, rent a bicycle or a horse to explore the countryside, go for a hike, swim in the pool, get a massage or simply enjoy the company of new friends. However you choose to spend your time, it promises to be a wonder-filled adventure and we hope you’ll join us! Join us on Erin’s annual retreat in our beautiful and chic region of Provence, France. Days on the Côte d’Azur, markets in Aix-en-Provence, lavender fields, and yoga overlooking the vineyards of the region of rosé – ending with a spa day of pure relaxation. Healthful, vegetarian food is part of the retreat experience, including breakfasts and dinners daily, as well as selected lunches. Enjoy cuisine which combines creativity and flavours with a special attention to creating balanced meals. Wholesome ingredients, freshness of the foods, cooking times and methods are present in every meal you will enjoy at the Bastide. Meals will be enjoyed on the terrace in the shade of the oak trees, or served by candlelight under the pergola or in the veranda. We’ll feast on traditional flavours of Provence mixed with the French, Italian and Mediterranean styles as well. Plus, throughout the week, we’ll have a chance to sample many regional wines, aperitifs, and other tastes such as cheeses and various other specialties. Spend six days/five nights with Aluma Yoga at the unparalleled Bastide Avellanne, a luxury bed & breakfast, nestled in the South of France, between Nice and Marseille. 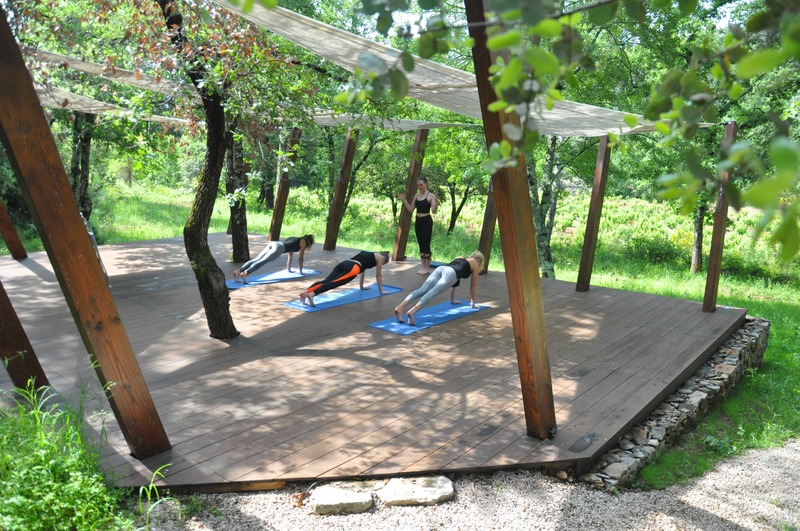 Each day begins with a flowing vinyasa practice in our own private outdoor yoga shala, overlooking the vineyards. We’ve organized several group adventures during our time together, including a trip to Cotinac to visit the local market and wine tasting. We’ll visit the Gorges du Verdon, a natural canyon with the bluest water you have ever seen. We’ll relax on the beach, swim, or kayak before frolicing in lavender fields on our way back. This trip would not be complete without some time shopping in St Tropez before arriving for an afternoon at the infamous Nikki Beach Club! We know you’ll want time to relax, and there will be plenty of opportunities for that, as well. Lounge by the pool or nap in the hammock. Take a leisurely stroll or a bike ride to the nearby village. Hike the mountain trails, indulge with a massage, or schedule horseback riding along the French countryside. This inspiring retreat will enhance your well-being, refuel your spirit, and invigorate your passion for life. Feed your flames with Aluma Yoga in the magical South of France. Join us for the 2019 Red Hot Yoga French Retreat at the stunning luxury yoga venue, Bastide Avellanne in Provence. Due to this retreat offering you the chance to be totally immersed in a variety of Yoga styles, you can enjoy trying out Hatha, Yin & Vinyasa as well as Mindful Yoga. Retreats offer a number of benefits of resting from your normal routine and being outdoors in nature. Deepening your yoga practice will help to give a fresh view and awareness of yourself and your life. You can choose to take the week as a retreat with more silence and reflection during the free time, or you may prefer to just relax, be on holiday and explore the French sites! The focus of this Retreat will be Strength & Stability, coupled with a daily Yin class to improve flexibility, with awareness on precision and connection with your breath, the very root of a solid Yoga practise. Amy will gather a circle of women this summer at the Bastide. The coven of women who are coming together to reconnect with their Divine Feminine are in the midst of their becoming. This retreat in France will support you moving into your next iteration and help you to get unblocked to fulfill the next step in your soul’s pilgramige in this lifetime. They create space and connections for you to become. Experiences through sacred sisterhood, expressive arts, movement, Qoya, guided imagery, tantric breath work, and connection to the land that will create portals of knowing, belonging, and coming home in your essence (heart, body & soul). Being witnessed by and connecting with this coven, you will have a remembrance of who you are and who you have always been (possibly even through lifetimes). From this place of your essence that has always been yours, you can live, love, create, dance, and rock out or into what has been seeking you. Come to the heart of Provence where we will connect to the sweetness of life and slow down. Daily yoga with a vineyard-view shala plus plenty of time to lounge by the pool, pamper yourself with a massage, savor the local culture, and enjoy the finest home-made and organic food on this 5-star eco-retreat in the most outstanding natural setting. A retreat is to come home and discover a new world within yourself. Join our Eco Yoga Retreat at the Bastide with yoga teacher Anna Gordh Humlesjö. Discover the joy of yoga with Annas teaching. Everyday is a perfect mix between dynamic and relaxing yoga and mindfulness practice carefully designed to suit everyone in the group. Between yoga classes and enjoying the amazing organic meals together, we have a lot of time for summer adventure. Discover charming Provencal markets, some of the most breathtaking beaches of the Mediterranean sea, or just relax in the stillness of nature around the Bastide, or at the side of the pool in the sun. One day we practice yoga together by the turquoise water of Europes larges canyon the Gorges du Verdon. A neighbouring local vinery gives us a vine tasting experience one evening, and another we enjoy outdoor cinema under the stars. Enjoy life at its fullest in the summer dream of Provacne with us. Hanan Palz and heather Taylor Wiest are so excited to bring you an experience that will deepen your faith, move your body, expand your horizons and invigorate your senses in the idyllic countryside of Provence France. We will include a group transfer from Nice Airport (NCE) and all meals. The afternoons free to lounge by the pool, hike, bike, tennis or explore the famous Provencal towns, villages and wineries. We have included 2 full day excursions & wine and cheese tasting event as well as daily 90 minute morning yoga in the beautiful yoga room or in the open air shala.